Nominations for executive board officers for the 2011-2013 term are now being accepted. Please contact the E-Board if you would like to make a nomination. In preparation to an update on the fraternity history booklet in 2011 (140 years of Delphic,) I created a timeline to illustrate the collective history all Delphic chapters. The timeline provides a great glance into the legendary history of the Delphic Fraternity. Please check out the Timeline by clicking the tab in the navigation bar above. Any comments, feedback, or suggestions are appreciated. Congratulations to the Kappa Chapter at UVA! After more than a year of hard work and determination, the Kappa Chapter at the University of Virginia was granted recognition by the school's Multicultural Greek Council. Congratulations to the newest chapter of the historic Delphic Fraternity! This October, The Delphic Fraternity celebrated its 138th anniversary! 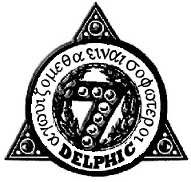 Happy Anniversary to all members of The Delphic Fraternity. Del - phi ! Congratulations to Komain Somapeera, the new president of the Delphic Executive Board 2009-2011! All the best to returning and new board members! I added two new links to the Links section. There is now an additional link to the history of Cortland and a pretty good comprehensive Wikipedia list of social fraternities and sororities. Check them out. The fraternity has been contacted by a group at the University of Virginia interested in forming a Delphic chapter. We look forward to working with this interest group to form a chapter of our historic organization at UVA. The year's re-establishing anniversary dinner will be held at the Gilded Otter in New Paltz on Saturday, March, 14, 2009 at 7pm. Please RSVP with the E-Board as soon as possible. Congratulations to Delphic Brother Sal! The fraternity would like to congratulate our brother Sal who married Meera on Valentine's Day. Congratulations Sal and Meera! Happy 137th Year Anniversary to all of Delphic!